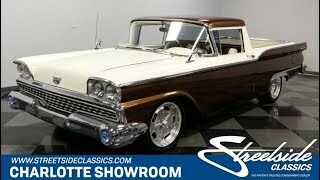 Hi, I am interested in your 1959 Ford Ranchero (stock #4592-CHA) listed on Autotrader for $24,995. I'd like to get more information about this vehicle and confirm its availability. Nicely coordinated, thoughtfully built, and extremely powerful - 1959 Ford Ranchero is distinction and muscle in one terrific vintage package. This is the pickup with terrific style lines. Its like a square Thunderbird with a truck bed. We love the design cues from this model like the flat front that looks even wider thanks to the quad headlight package. The bright work package including the wide bumper and full-width grille is complete and shining. Plus, the arched tail fins run from the door handles until they meet up with the jet-inspired taillights. And if that wasnt enough to get you inspired, the metallic brown paint with a bright white sandwiched in-between has as much appeal as going to a car hop for a root beer float. Another reason why these Rancheros stir a lot of attention is because of rarity. This was the final year for the big Ranchero. Ford was discontinuing them because they werent as popular as other models. That makes them a rare sight today with just over 14,000 examples produced (so just imagine how fewer are left six decades later!) But more than just history, you can tell this one is something extra special with upgrades like the LED surrounds in the headlights, LED fog lights, and white bed liner paint. While the American Racing Salt Flats wheels are a classic design, there large size and huge shine hint at upgraded performance (more on that in moment.) Owning a cool looking cruiser means a matching interior. This white and brown coordination includes the carpets, dash, and door panels. The seats are particularly comfortable with nice brown cloth inserts for where you sit, and theres also a fold-down armrest for individualized luxury. This is even power adjustable! While you have nice upgrades like an AM/FM/cassette stereo and auxiliary gauges, this one never loses its classic feeling. Thats because once you slip behind the artful steering wheel and gaze at the factory gauges, this gives the perfect vintage atmosphere. When you look under the hood of a full-sized Ford, you expect to see plenty of motor, and this one doesnt disappoint. This Ranchero came along at the beginning of the big block era, but it never received something this wild. Its a huge 460 cubic-inch V8, and you can instantly see that big displacement is far from the only powerful upgrade. Roller rockers, Comp Cams camshaft, MSD distributor, Ford Motorsport valve covers, an aluminum intake, and a Holley Street Avenger four-barrel carburetor headline an impressive performance package. The C6 three-speed automatic transmission is stout enough to get all this power to the pavement. Plus, factory features like power steering are joined by great upgrades like the four-wheel disc brakes and modern BF Goodrich gForce tires to give this classic some modern moves. This Ranchero looks great, sounds great, and has tons of power. So its a total package classic for those who love muscle and want to be memorable. If thats you, call today!